Scuba diving is one of the popular adventure sports activity, we have to take care of several things before scuba diving. This article is about the 10 things we need to know before scuba diving in Kerala. Kerala is one of the best tourist destinations in India, especially if one wants to do scuba diving. With warm coastal waters that allow the growth of corals and flourishing of the marine life, Scuba Diving in Kerala is one of the most popular activities among the tourists. The following post comprises the most important things one must know before scuba diving. Find all you want to know about the water sport to make the best of your time and activity. To do Scuba diving in Kerala, you needn't be a swimmer. Scuba diving doesn't require any swimming skills. You will not be left alone for a single moment under the water and there will be one guide diver per person. You just have to let it be and witness the underwater marvels that unfold before your eyes. Don't be afraid for your life and miss all the fun..!! You will never drown or die during Scuba diving in Kerala. Actually, the people that enter the sea for the first time generally don't know that the corals are present at shallow depths. Hence, they will never ever enter the deep water during the diving. Further, you will have the gears that keep you safe during the sport. And of course, the PADI Scuba Dive Instructor who's with you throughout the dive will solve if there is any uncomfortable feeling or bring you on to the surface within 2 or 3 seconds in case of any incident. so, be relaxed and make the best of your time. Yes, you read it right..!! Nobody has the time to learn the technicalities of the diving on a trip. 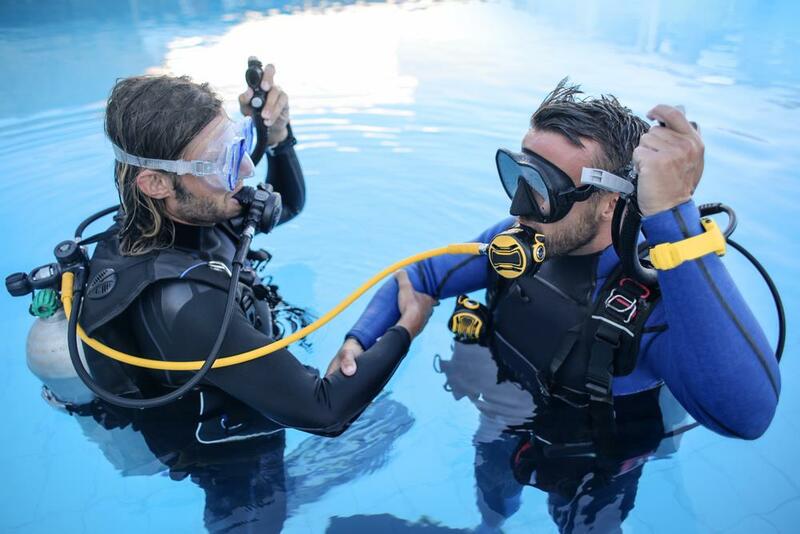 So, PADI Scuba Dive Instructor will explain to you the signals and warning signs you would use for communication under the water which will take only a few minutes. They will teach you how to use the mask for breathing and also how to defog your mask in case if moisture creeps in. The whole process gets completed within a few minutes and you will be prepared to dive into the water without further ado. Kerala is one of the best Scuba Diving destination. Scuba diving in Kerala is one of its own kinds and offers the opportunity to witness the underwater beauty of the warm coastal waters of the state. The state has the best places to try the sport. Before you venture into the waters, you will be asked to fill a form in which you will be asked to fill some crucial information such as your disease history, operation history and other illnesses. In case you have experienced some illness or medical treatment that might cause harm to your body under the water, for example, some operation or heart problem, then please don't cheat and stay away from diving. The pressure under the water is more than the atmospheric pressure which can play havoc with the body that is not well. Don't panic in any condition. If you don't find your mask working perfectly, please maintain the calm and give a signal to your PADI Scuba Dive Instructor. He will help you out of the situation in no time.. Though there are a number of Scuba diving destinations in Kerala; you should choose one for yourself only after confirming their certification and taking some reviews. Bond Safari Kovalam is the best option to make your first experience of Scuba diving in Kerala the best one. All the divers are certified; the gear is new and as per the international standards; and the divers will help you make the best of your time. Though it happens very very rarely; in case you drop your breathing tube or the regulator, you can always pick it up. Always remember that you can easily hold your breath for 10 seconds or more on the land. Same is valid under the water. While you are enjoying the dive, the guide diver will be observing each and everything and in case any mishap occurs, you will be on the surface earlier than you know. In case you find yourself getting sick in the stomach when you are in the sea; or have got yourself a sea-sickness headache or vomiting bout owing to swell in the sea; you should take the tablet for the same well before the scuba dive. The tablet will also take some time to work. Further, don't take any greasy food just before going for Scuba diving in Kerala. This leads to problems in digestion and nausea or vomiting which might pose a problem while you are under the water. Bond Safari Kovalam offers a unique and new style of Scuba diving in Kerala, via the Bond Scooters. In this, you will be riding a scooter with a helmet like a complete mask on your head which allows you to breathe naturally under the water as well. The scooter will scoot under the water and you will be able to enjoy a water ride without having to worry about breathing mask or anything. To know more about the other services offered by the Bond Safari Kovalam and make your vacations really the beach vacations, log on to www.bondsafarikovalam.com.